Hegathe has some association with assassination. The first mention of the Dark Brotherhood was found in the journals of the "Blood Queen" Arlimahera, who ruled Hegathe circa 2E 412. She wrote of slaying her enemies by her own hand, or if necessary "with the help of the Night Mother and her Dark Brotherhood, the secret arsenal my family has employed since my grandfather's time". According to the historical fiction 2920, The Last Year of the First Era, it was an initiate in the local Morwha conservatorium who killed Emperor Reman III, an event which heralded the end of the First Era. The city played a key role in the Great War. 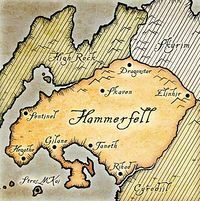 After instigating hostilities, the Aldmeri Dominion invaded southern Hammerfell, and by 4E 172, they controlled the entire southern coastline except for Hegathe, which they besieged. But in early 4E 173, a Forebear army from Sentinel broke the siege. This defeat and a subsequent bloody clash with the Imperial Legion left the Dominion forces too weak to advance any further. Additionally, the Forebears coming to the aid of the Crowns led to the reconciliation of the two factions. The Osseous Crux was discovered on the coastline near Hegathe. The Crux was relocated to Sentinel, though it soon vanished. Sacrilege and Mayhem in the Alik'r is a report to the Hegathe royal family on rumors of necromancy in northern Hammerfell.